We just had our new digital panoramic x-ray machine installed. The new x-rays don't cost you any more than the old ones (same fee). So what's the big deal you say? With this new machine the necessary radiation exposure can be reduced 80-90% versus the old film based machine. That is very significant. Also, we get excellent images. I mean we can catch stuff while it is still very small. Small problems equal small solutions. That means less time for you in the dental chair. Another awesome benefit is this machine can take bite-wing x-rays. 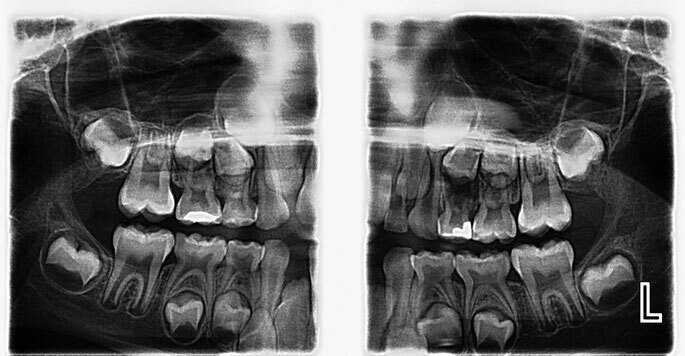 Bite-wing x-rays are the x-rays that show cavities between your teeth and the bone levels around your teeth (among other things). If you have a very small mouth (great for kids), or you gag easily, this machine can take your x-rays without having to put the sensor into your mouth. It is not quite as detailed as the sensor in your mouth, so we try to use that if possible, but it is very accurate. I already love it. Also if someone is in a lot of pain with a toothache, they won't have to "bite down" on the sensor holder while they are in pain. This means x-rays just got more comfortable. I attached an x-ray we took TODAY! This is not cherry picked image, just the stuff we get every day with our new machine. I will also put a picture of the bite-wing x-rays on my website. So why do we take these panoramic x-rays every 3 years? -Verify proper growth patterns in children/adolescents. These are the 5 things I look for every time I look at a panoramic x-ray. Here is a bite-wing x-ray we took on our machine today as well. This 7 year old little girl (an ANGEL and braver than most adults) came in with pain on her left side. Everything looked ok with her tooth, but she did have some swelling in her gums. She has a very small mouth and was having pain when biting down with her tooth. She was able to hold still for the x-ray (less than 10 secs) and we were able to get all the necessary information plus extra. All with no more radiation exposure. The x-ray and an exam showed an abscess under her baby tooth. We were able to take care of her and, like I said, she was amazing.